I recently had a chance to look into TensorFlow, Google’s “open source software library for numerical computation using data flow graphs,” specifically looking to implement artificial neural networks (ANNs). Most of the introductory tutorials on ANNs with TensorFlow involve building and training networks to classify handwritten digits. In order to better learn the building blocks of TensorFlow—and to refresh my memory of both Python and neural networks—I wanted to start much much smaller, beginning with the simplest possible ANNs and working my way up. I’ll describe building and training perceptrons to perform boolean operations using TensorFlow’s Python API. In order to focus on implementation for newcomers (like myself) to TensorFlow, I’ll assume basic background knowledge concerning Python and ANNs. Our training data consists of the truth table for AND, with the four possible pairs of operands as our inputs, and the operation’s respective results as our outputs. Note that the bias is implemented by adding an extra value of 1 to all training examples. T, F = 1., -1. That’s a tensor that is variable — so its value may be changed on each evaluation of the model as we train—with all values initialized to normally-distributed random numbers. Note that Session.run will return the result of whatever is evaluated. On each epoch, we evaluate mse in order to track progress, and train to actually adjust the weights. If you go ahead and run the code, this extremely simple network should arrive at a solution in just a few training epochs. Training this network to perform OR is an equivalent problem. Just change the desired output (train_out) to appropriate truth values and the network will arrive at a solution just as quickly. Hopefully this overview has provided a digestible introduction to TensorFlow that will allow you to dive into more realistic applications. 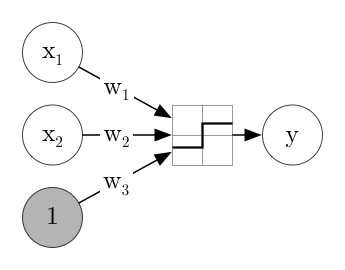 For a more in-depth implementation and discussion of training an XOR network, see Stephen Oman’s excellent article Solving XOR with a Neural Network in TensorFlow; or dive right in to TensorFlow’s tutorials.